Cómo llamar a Vietnam desde EE. UU. International calls can be a veritable pain in the neck. So if you’re having a time of it calling Vietnam, you need to take a breath and then take a look at our user-friendly “How To Call Vietnam” guide. Luego marca 84, el código de país de Vietnam. y finalmente, el número de teléfono (5-7 dígitos). Need more help with how to call Vietnam? Remember, international calls to mobile phones in Vietnam are dialed just like any other international call. For example, to call a Vietnamese mobile phone from the U.S., dial 011 + 84 + 1 + area code + number. However it usually costs more to call mobile phones than fixed lines in Vietnam, but if you look into mobile number prefixes, you can find out what kind of number you're calling beforehand. To find out how to save on international calling to landlines and mobiles, keep reading. How can I save on international calls to Vietnam? 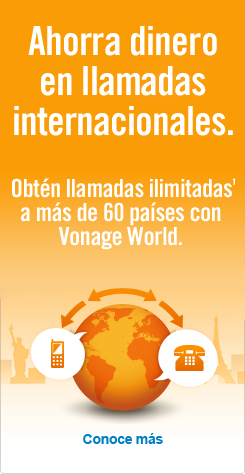 To start making inexpensive international calls, look into Vonage. Whether you're reaching out to Dad in Da Nang or reconnecting with an old flame in Phan Thiet, check out Vonage World®! Don't let hidden fees and complicated calling cards make your call back home a frustrating one. Get cheap calling to Vietnam landlines and mobiles with Vonage World! Check out our great tarifas de llamadas internacionales to Vietnam here. Here’s a thought — you should give the gift of Vonage World to your friends or family in Vietnam! It’s super easy. All you need to do is sign them up for a Vonage World account and ship them the Vonage Box™!¹ Presto, you're done. Now they get unlimited² calls to landlines and mobiles anywhere in the U.S. because they'll have the same U.S. area code as you. No international rates to call Vietnam. And if all parties involved have Vonage for a service provider, calls between you and them are free! Vonage works wherever there's a high-speed Internet connection, so be sure you're linked in to a reliable source.